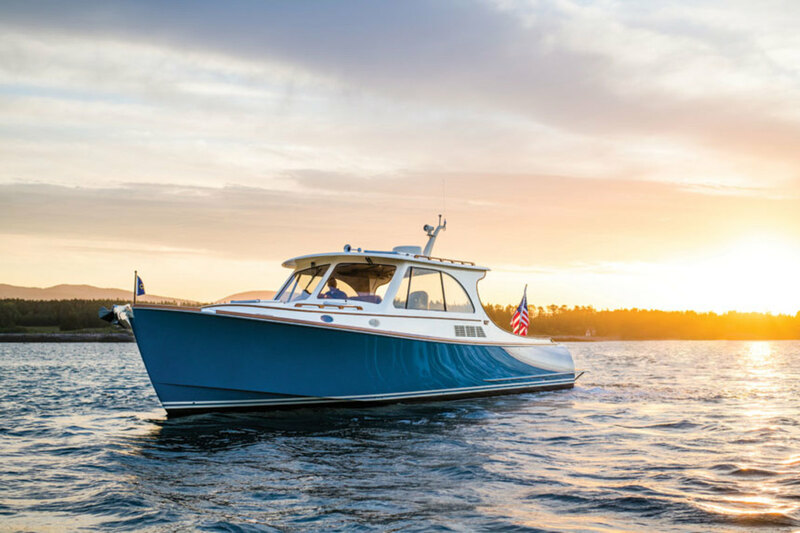 The Hinckley Picnic Boat 40 will get you to your favorite anchorage safely, quickly and stylishly. I tell him I’d love to see it. He warns the rest of the crew to brace themselves, and with a flick of his wrist, he reverses the buckets on the boat’s jets. The twin HamiltonJets switch their forward thrust, and the bow falls from its perch above the waves and drops deep into the water. The boat’s progress is completely stalled, the bow pops back up and the Picnic Boat is sitting still in the middle of the river. It took less than 4 seconds and four boat lengths. O’Connell, who is The Hinckley Company president and CEO, has a big grin on his face. He knows the boat just did something really impressive, and he is right. 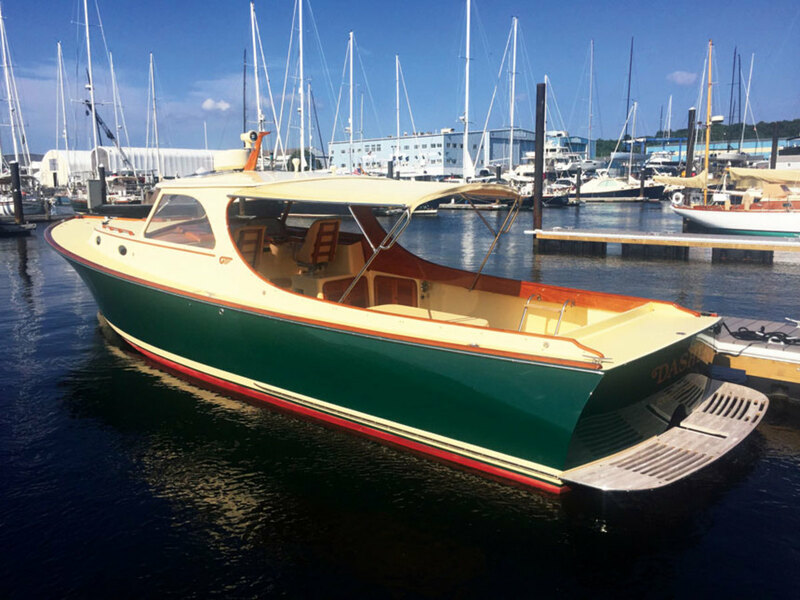 Before naval architect Michael Peters and the Hinckley design team drew the 40, Hinckley did market research, in particular with current Picnic Boat owners. They wanted a bigger, even more user-friendly boat than the 37- and 34-foot models. One thing Hinckley added is a hull-side door. On previous Picnic Boats, people would step on the swim platform and then use the transom door, or they would swing a leg over the side of the boat to get into the cockpit. On the 40, Hinckley added the door on the starboard side of the cockpit and created a nifty way to have it hide inside the hull, instead of taking up cockpit space when it swung open, says Peter Saladino, Hinckley’s chief marketing officer. Owners also didn’t want to lean over the gunwale (and the water) to reach an interior door handle, so Hinckley made the door remotely operated. O’Connell demonstrated the feature by pushing a button on his boat’s key fob, which caused the door to open, fold itself into a neat little package and then slip itself inside the gunwale. To make shorthanded docking easier, the starboard side of the 40 has an unobstructed path from the helm to the stern. Both the pilothouse’s L-shaped lounge and the cockpit’s fore and aft seats are to port. The positioning gives the helmsman or mate clear access to the starboard side of the boat to handle lines without tripping over docking-averse or boat-agnostic guests. A single step leads up to the pilothouse, which is open and bright with excellent views. An L-shaped lounge is to port with another brightly finished teak folding table. Forward of the lounge is a captain’s chair, and to starboard is a double seat. The console is constructed in Hinckley’s signature varnished teak and has the same curve across the top as the original Bruce King-designed Picnic Boat. 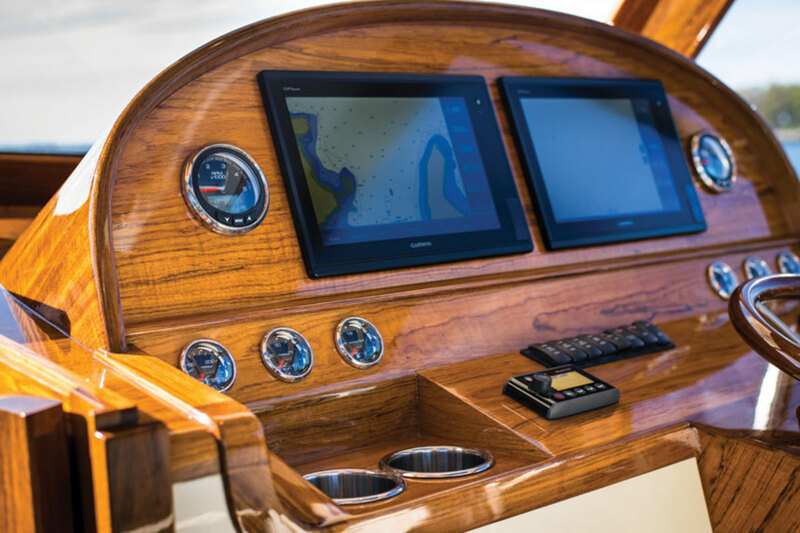 The console accommodates two Garmin touch-screens and eight gauges with stainless bezels (a nice touch) to monitor engine functions. Abaft the helm station is a wet bar: Hydration and libation are rarely out of reach aboard this boat. A few steps down from the pilothouse is the forward cabin. 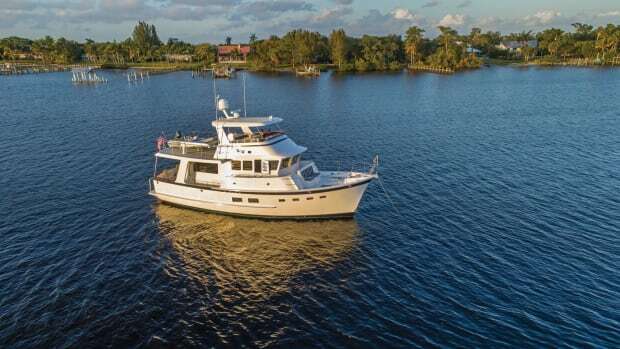 The port galley has deep counters, cherry cabinets, a two-burner electric stovetop, twin sinks, a microwave and a refrigerator. Headroom in the cabin is 6 feet, 3 inches. The brightly varnished holly and teak sole is constructed of veneer over foam core. As O’Connell says, “You get the wood without the weight.” Foam core is also used in the hull and decks. The 40 weighs in at 25,000 pounds. That may seem like a sizable increase over the 37’s 19,000 pounds, but the 40 is over 5 feet longer and 19 inches wider, which adds up to a lot of additional interior volume. 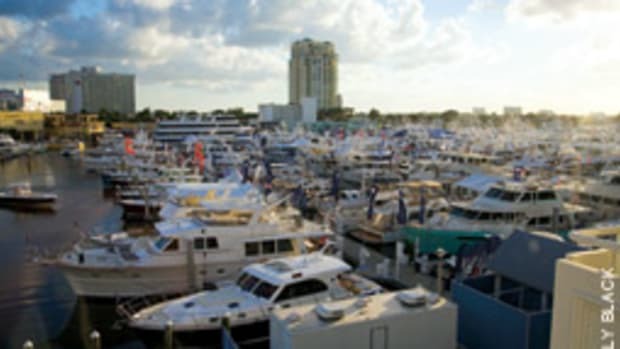 The 40 dwarfs the nearby 37-footers in the harbor. 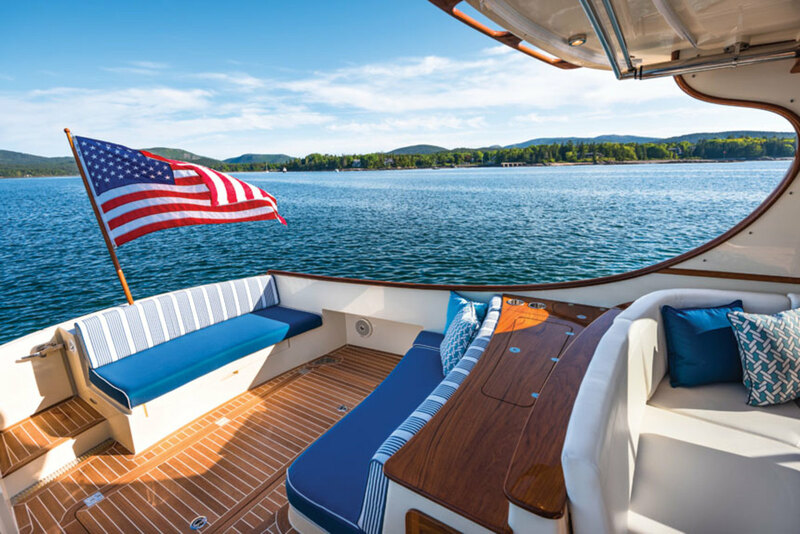 Like all of Hinckley’s Picnic Boats, the 40’s hull uses puncture-resistant Kevlar on the outside with Corecell M foam and carbon fiber for strength inside. But unlike previous Picnic Boats, the 40 does not use vinylester. Hinckley orients the Kevlar and carbon layers for optimal load-carrying ability and infuses the entire hull with epoxy to chemically bond the materials. There is no cosmetic layer. All boats are Awlgripped at the end of the construction process. By switching to this construction method, which Hinckley says is stronger and more expensive, but also more environmentally friendly, the builder aims to end through-printing that may occur as boats age. The process is now used to build all Hinckley boats, with hull and deck construction guaranteed for life. 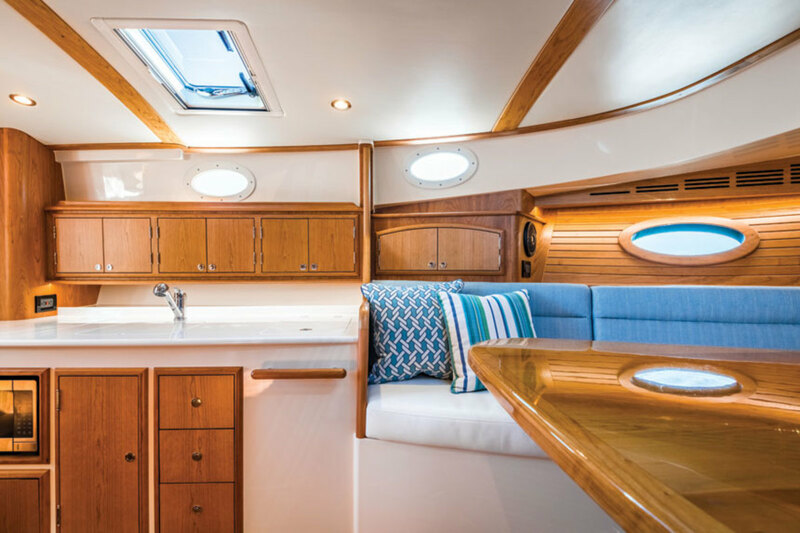 O’Connell opted for standard white surfaces with satin-finished cherry cabinetry for a clean-looking, Herreshoff-style interior. The fit and finish on the cabinetry is typical Hinckley: perfect. 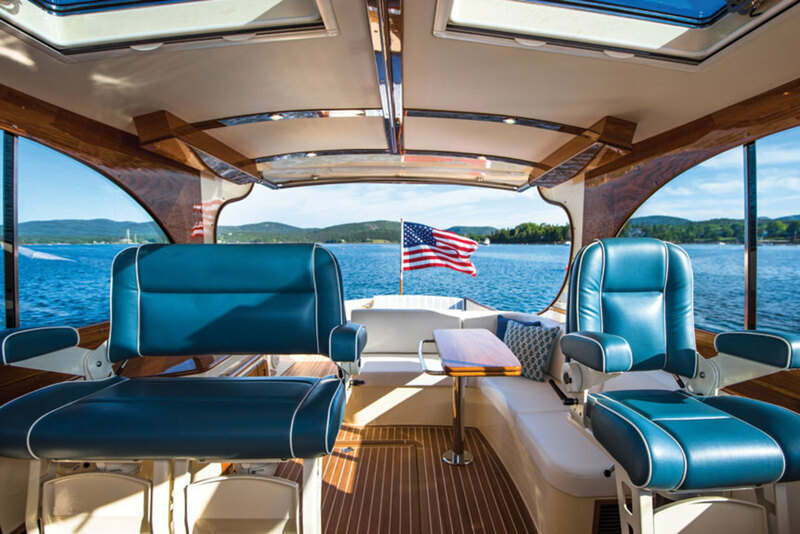 With an open layout that includes bow seating around another brightly finished teak table, and with lots of portholes, hull ports and overhead hatches, the cabin is light and spacious. The table converts to a berth, and the cushions have dedicated stowage behind the steps to the pilothouse. An Island King arrangement will be made available in the future. Hinckley did not skimp on the roomy head and shower, which share a space to starboard of the galley. The shower has a wet locker inside the shower bench for bathing suits, and a bifold glass door to keep the head dry. Although the head and shower take a fair bite out of the cabin space, nothing feels cramped. 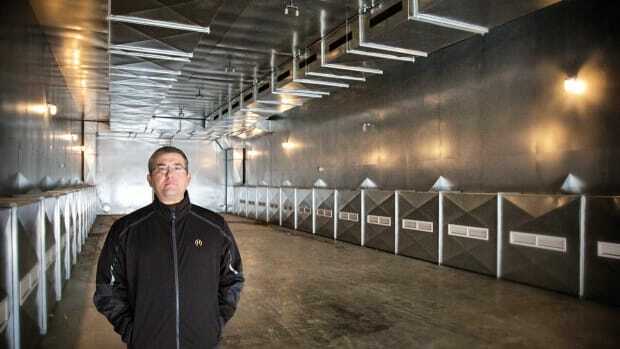 Ventilation inside the cabin from above is good, and air conditioning belowdecks is standard, so if things get too hot, owners can close off the cabin from the pilothouse and chill out using shore power or by firing up the optional generator. Air conditioning is available as an option for the pilothouse as well. O’Connell did not choose it for Champlain; the pilothouse is wide open at the stern, and because the windows and overhead hatches all open, there is ventilation from all four sides and above. The boat’s electrical systems are controlled by choosing pre-programmed options from the CZone multifunction display. It is mounted to port of the cabin steps, but instead of being a traditional fuse panel with dozens of switches, it is minimalist and lets skippers switch from day to night mode with the push of one button, or control individual lights one at a time. The engine compartment is well lit and big enough to access the twin 480-hp Cummins diesels. 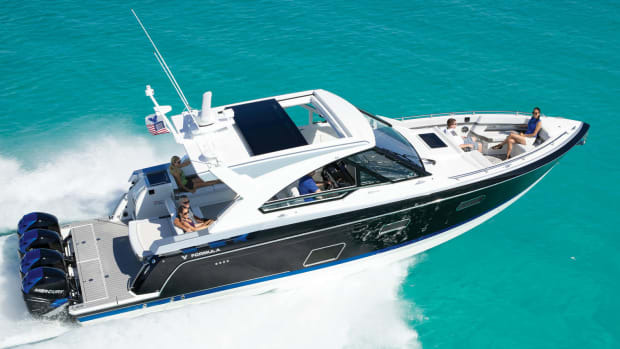 Optional 550-hp engines are available and take the builder’s reported top speed from 35 to 38 knots. You won’t be throwing a party down here, but that’s what the rest of the boat is for. A second hatch aft in the cockpit allows access to the HamiltonJet 322 water jets and provides additional stowage. The original, 1994 Picnic Boat, with its rudderless, flat stern and single water jet, was a great boat. But according to an interview Peters gave to Soundings in 2008, it was “prone to bow steering and stern sliding in certain sea conditions.” Peters addressed that in the Picnic Boat 37 by increasing the deadrise to 19 degrees at the transom and by adding a fuller bow. That trend continues on the 40, which tracked beautifully, even in tight turns, during my sea trial. The visibility from the helm was, well, fantastic. The view aft was completely unobstructed, and as I turned the boat while standing at the helm, I was able to see 360 degrees around me. Sound levels at the helm at cruising speed were in the high 70 to low 80 decibels, and conversation in the pilothouse was easy. The noise level increased only minimally later, when O’Connell jammed the throttle wide open and pushed the 40 to 36 knots — a knot past its advertised top speed of 35. The hull-side door automatically stows in the gunwale, allowing for easy boardings. An extended swim platform is an option. These numbers supplied by Hinckley Yachts. O’Connell jokes that he got himself the toughest slip in the marina, and he may be right. It has only about 50 to 60 feet of water forward of it, and to port is a sloping wall of riprap. Using the joystick in dock mode (one of four drive modes available on the latest generation Jetstick system), O’Connell backed the boat in and made the task look easy. Performing the same move in that spot on a similar-sized, traditional boat, even with a bow thruster or twin screws, would require some serious boat-handling chops. I still prefer the wheel to the joystick, but after a quick Jetstick primer, I was turning the boat in place with a twist of my wrist. If you are used to props, rudders and a wheel, then the thought of driving a jet-powered boat with a joystick might not be appealing, but driving a 40 with jets has its merits. And Hinckley provides new owners with three full days of orientation and hands-on training under the tutelage of a Hinckley employee. Its certified pre-owned program provides the same service. 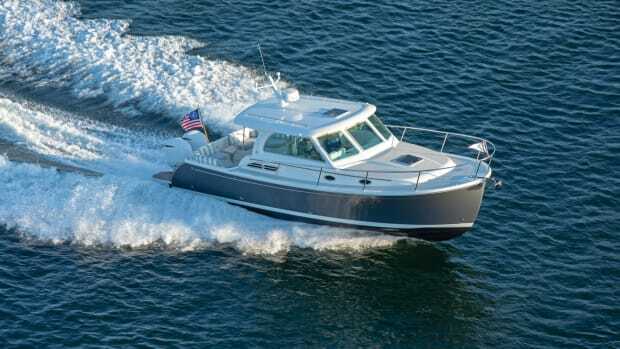 The Hinckley Picnic Boat 40, like its predecessors, is a day or weekend boat for a couple or family, but I could easily see myself taking a boat like Champlain for a lengthy cruise down the Atlantic seaboard to the Bahamas, or up to Maine for a few weeks. I know the galley is not designed for long voyage provisioning or prepping gourmet meals, but Hinckley entertains custom option requests. Hang a stainless grill off the stern, and you’re ready to go. The Hinckley Company was founded in 1928, and even though it had been building motorboats since before World War II, it developed a worldwide reputation after the war for its beautiful and seaworthy sailing yachts. Its Bermuda 40 sloops and yawls are considered classics and have retained their resale value. That first Picnic Boat was a 36-foot long, single-jet beauty with a fine entry and lovely tumblehome that exported the Down East look to the rest of the world. It was one of the first boats of its size with water-jet propulsion and joystick control and was well ahead of its time. After its launch, in the summer of 1994, the Picnic Boat suddenly became hot and soon celebrities like Martha Stewart and Geraldo Rivera were snapping them up. Other boat builders realized Hinckley had struck gold, and soon designed their own versions, though those who laid claim to the Picnic Boat name soon learned that if it wasn’t a Hinckley, it wasn’t a Picnic Boat. Extended Pilothouse versions, between 1994 and 2008, when it was replaced with the Michael Peters-designed Picnic Boat 37 Mark III. 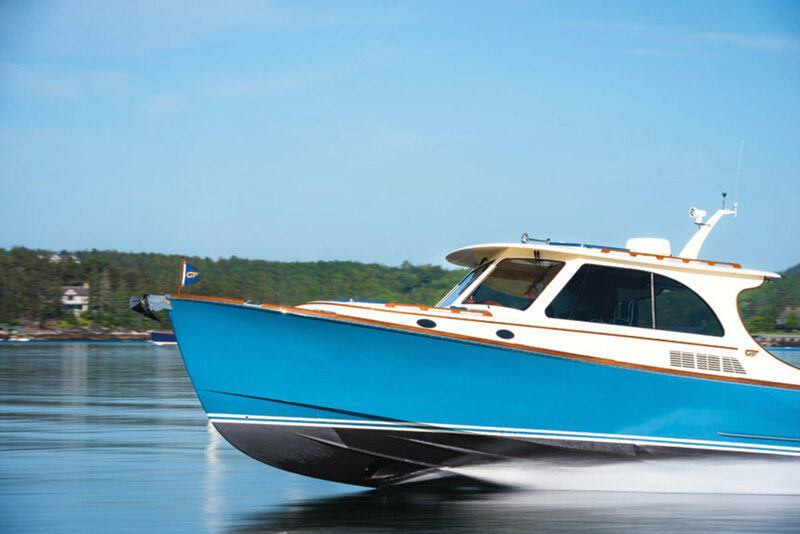 Peters’ 37-footer was an updated version of the 36-footer, with twin engines, 14 additional inches of beam, 13 more inches of length, extra deadrise aft, a fuller forefoot, larger interior space, greater speed and improved handling — all while retaining the original Picnic Boat’s style. 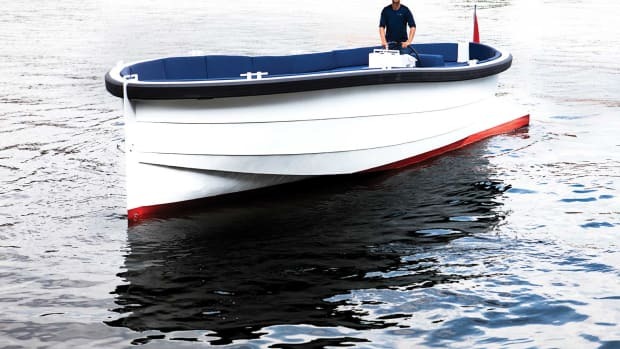 “It’s a modern bottom, melded with a classic-looking boat,” Peters told Soundings in 2008. 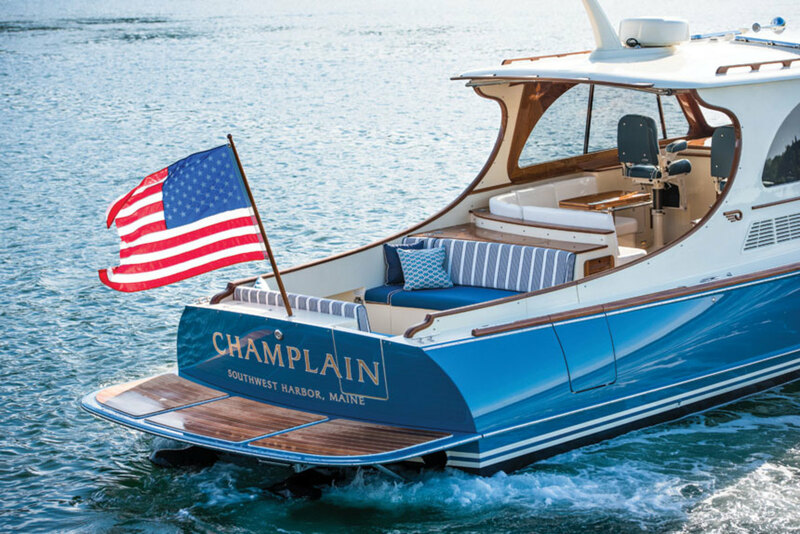 In 2013, Peters also designed the Hinckley Picnic Boat 34. 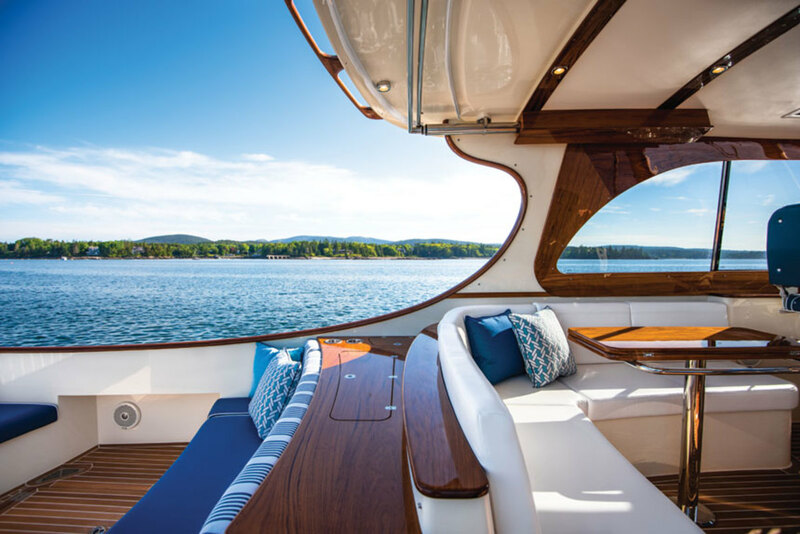 The Hinckley Picnic Boat 40 is now the largest, latest evolution of both King’s iconic boat, and Peters’ 37-foot design. Today, The Hinckley Company builds about 50 Talarias and Picnic Boats per year and in total has built more than 1,100 jet-drive boats. The company now builds only about one or two sailboats per year, mostly made by Morris Yachts, which Hinckley purchased in 2016. The Dutch like to use old lifeboats as party platforms in Amsterdam’s canals. Inspired, Meindert Wolfraad created the Lekker Damsko1000, an open boat with speed and room for friends. Vetus has expanded its line of Bow Pro series thrusters to include models for 45- to 80-foot vessels. 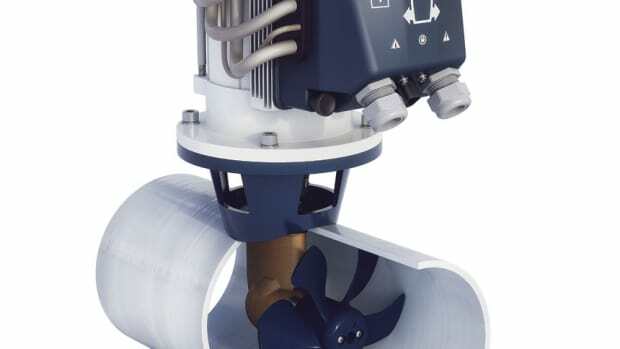 The Bow Pro Boosted thrusters use a brushless motor that’s reportedly maintenance-free for 12-volt or 24-volt inputs, and is designed to fit tunnel sizes up to 250 mm. The thrusters come with a standard or a fully proportional control panel and now have unlimited run-time. Price: $2,169 to $4,519. The day was glorious by any standards but it was early February and anything short of a blizzard would have thrilled the winter-weary crew that had just cast off for Fort Lauderdale, Florida. 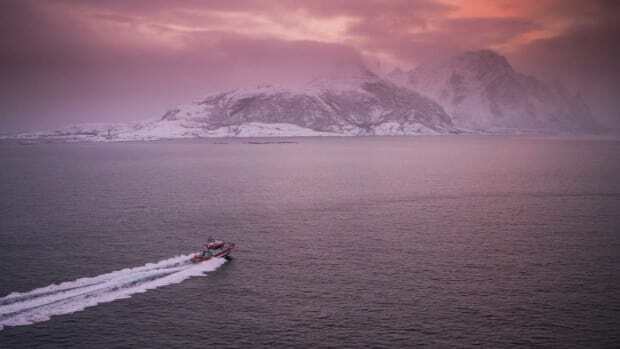 Pim Van Hemmen takes an icy ride with the Norwegian Society for Sea Rescue in cold and sometimes dangerous waters north of the Arctic Circle.